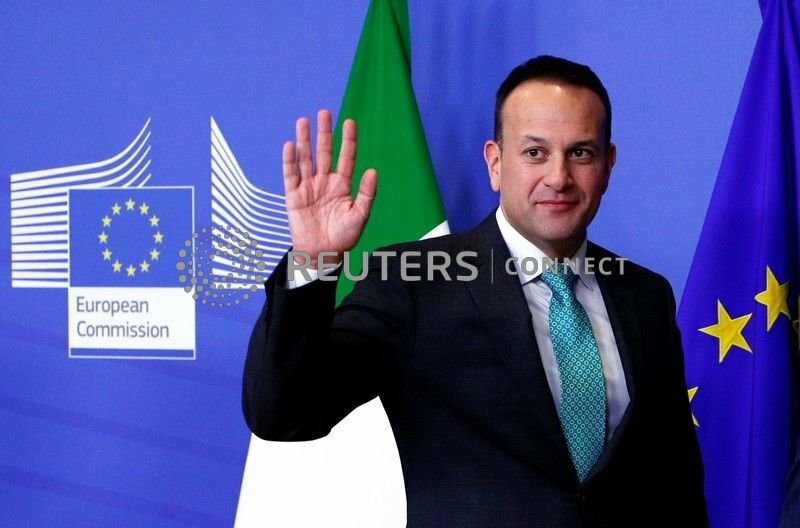 DUBLIN/BELFAST (Reuters) - Irish Prime Minister Leo Varadkar on Friday said he believed "a deal can be done" to avoid a disorderly British exit from the EU, after a meeting with a key ally of British Prime Minister Theresa May that he said went very well. Varadkar, who later met May for a working dinner in Dublin, said talks with Northern Ireland's Democratic Unionist Party in Belfast showed there was "more that unites us than divides us when it comes to Brexit," unusually conciliatory language in what has often been an acrimonious relationship. The DUP, which props up May's government, has been one of the fiercest critics of Britain's exit deal with the European Union, which parliament in London has rejected and more particularly of the contentious "backstop" championed by Varadkar. The provision is an insurance policy meant to keep the border between euro zone state Ireland and the British-run province of Northern Ireland open under any and all circumstances. The DUP says its terms are unacceptable as they would undermine trade between Northern Ireland and the rest of the United Kingdom. The EU has said it will not remove the provision or re-open the legally binding Brexit deal agreed with Britain over two years but it has said it is ready to rework the political declaration that accompanies it. After the meeting, DUP leader Arlene Foster said she had a "good engagement" with Varadkar and that the DUP wanted "to be as helpful as we can to try and get a deal that works for the United Kingdom and also works for the European Union." She declined to comment on the detail of the talks, saying both sides needed space to complete discussions. The support of the DUP's 10 members of parliament is seen as key to May winning over sceptical members of her Conservative party and securing parliamentary approval for the withdrawal agreement. Asked by Irish state broadcaster RTE how he envisaged a deal could be done between Britain and the EU after weeks of stalemate, Varadkar cited the common ground between the Irish government and the DUP. Both sides, he said, wanted to avoid a hard border in Northern Ireland, ensure Britain left with a deal and enable frictionless trade. "Often when you share all the major objectives, it is possible to come to a solution," Varadkar said. Speaking ahead of his meeting with May, Varadkar said the dinner would aim to "see confidence and trust restored" but would not involve actual negotiations, which are being led by Brussels. "I think that on balance we will secure a deal - whether it will be by the end of March or after an extension I can't say," he told RTE.